Dr. Aslam is an Assistant Clinical Professor, University of California-San Francisco (UCSF) and a Staff Radiologist, San Francisco Veterans Administration Medical Center (SFVAMC). Dr. Yee is the Vice Chair of Radiology, UCSF and the Chief of Radiology, SFVAMC, San Francisco, CA. 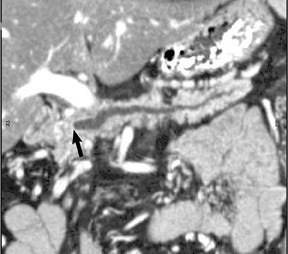 The imaging of pancreatic masses has evolved considerably since the introduction of multidetector computed tomography (MDCT). This new technology has enabled the acquisition of thinner slices during multiphasic scanning, with improved spatial resolution of axial, multiplanar reformatted, and 3-dimensional (3D) images. Pancreatic adenocarcinoma is the most common malignancy of the pancreas and accounts for up to 90% of all pancreatic tumors. Other, less common causes of pancreatic masses include solid tumors (such as islet cell tumor [ICT]), lymphoma, mesenchymal tumor, metastasis to the pancreas as well as a variety of cystic lesions. 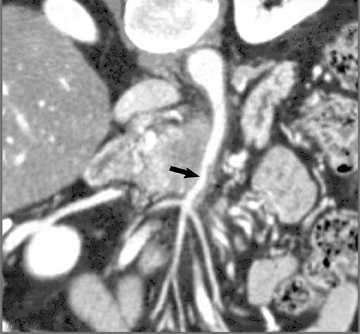 Inflammatory masses of the pancreas related to either acute or chronic pancreatitis may also simulate a pancreatic neoplasm (Figure 1). 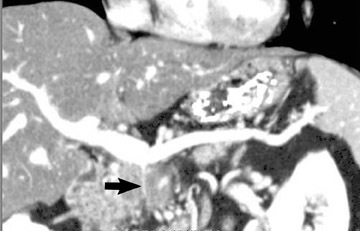 MDCT allows multiphasic contrast-enhanced scans of the pancreas, so that data is acquired during optimal pancreatic enhancement, aiding tumor detection. Optimum vascular opacification is also more reliable, enabling assessment of vascular invasion by tumor. The pancreas may also be scanned using thinner slices, which improves resolution and can aid in the detection of smaller lesions. Water is the preferred oral contrast agent because it is well tolerated by patients and acts as an excellent negative contrast agent that allows for improved visualization of the duodenum and the small bowel when intravenous contrast is given. 1 A negative oral contrast agent is also helpful if postprocessing techniques are to be used to evaluate pancreatic vessels. Accurate timing of the data acquisition is dependent on the type of CT scanner utilized, the rate of contrast administration, and the patient's cardiac output. 2 A fast contrast injection rate of at least 3 to 4 mL/sec is essential for optimal tissue enhancement. Bolus-tracking software is commercially available to help with accurate timing of CT data acquisition during the various phases following contrast injection. MDCT allows for rapid scanning of the abdomen-from the level of the diaphragm to the iliac crest in <20 seconds. The final phase is the venous phase, which is acquired 60 to 65 seconds after the start of contrast injection. During this phase, the mesenteric arteries and veins achieve maximum enhancement, which is essential for the accurate depiction of vascular invasion. 5 This phase is also the most sensitive for identifying hepatic metastases. The timing of the different phases of the CT study may be adjusted manually to accommodate for variables such as the patient's cardiac output and body habitus when bolus-tracking software is not employed. The CT data is available for postprocessing following scan completion. There are many commercially available computer software packages that allow rapid multiplanar reconstructions and 3D renderings. The user can manually trace the pancreatic or biliary ducts to create curved planar reconstructions (Figures 2 and 3). Further manipulation of the CT data set can be performed using 3D techniques, such as maximum intensity projection (MIP) and volume rendering. 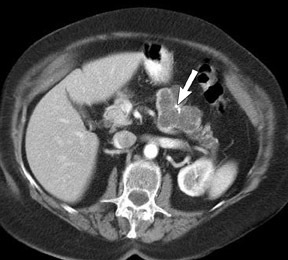 Real-time manipulation of the CT data generates images in multiple planes to best depict the pancreas and adjacent structures. The detection rate for smaller tumors has been disappointing, with studies reporting sensitivities of 67% and 58% for lesions <1.5 cm and 2 cm, respectively. 9,10 A recent study by Bronstein et al 11 found improved lesion detection, reporting a sensitivity of 77% for pancreatic tumors that are <2 cm in size, with a specificity of 100%. This study was partially performed using MDCT with narrow collimation (2.5 mm). Contrast-enhanced triple-phase scans were performed using arterial phase, pancreatic parenchymal phase, and portal venous phase scans. Adenocarcinoma of the pancreas consists of a dense fibroblastic stroma with reduced vascularity in comparison with normal pancreatic parenchyma. 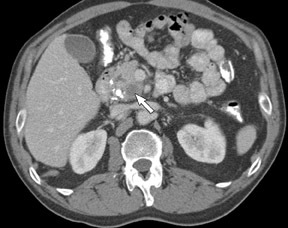 12 Tumor tissue enhances less than normal pancreatic tissue does and appears as a hypodense mass on contrast-enhanced CT. Larger tumors may distort the pancreatic contour and extend to infiltrate adjacent structures. Obstruction of the main pancreatic duct distal to the tumor is often present because these tumors originate from ductal epithelium. Adenocarcinoma located in the pancreatic head may also cause obstruction of the common bile duct, giving rise to the double-duct sign (Figure 2B). Pancreatic adenocarcinoma readily extends to the peripancreatic fat and vessels, especially since the pancreas lacks a capsule. Tumor resectability depends on the extent of local extension or vascular involvement in the absence of distal metastases. 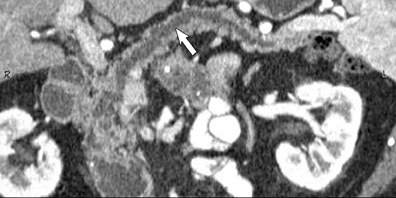 Lu et al 16 proposed a CT-based grading system for determining vascular involvement by pancreatic carcinoma. The authors prospectively graded vascular involvement using the pancreatic phase. A scale of 0 to 4 was used based on the degree of circumferential contiguity of tumor to vessel, where 0 was no contiguity and 4 was >75% contiguity. These criteria were applied to both arteries and veins, and it was found that if >50% of the vessel circumference (grades 3 and 4) was in contact with tumor, then there was a high likelihood of the tumor being unresectable. A sensitivity of 84% and a specificity of 98% were found for determining tumor resectability based on vascular involvement. The use of MDCT improves the resolution of sagittal and coronal multiplanar reformatted images and allows for improved detection of changes in vessel caliber 17 (Figures 4, 5, and 6). Diehl et al 15 reported that helical CT with dual-phase imaging was able to detect vascular invasion in 35 of 40 (88%) patients with pancreatic adenocarcinoma and a negative-predictive value of 79% for determining nonresectability. Raptopoulos et al 18 obtained CT angiograms in 82 patients and found that CTA improved the accuracy of diagnosing unresectable pancreatic carcinoma. The addition of CTA to conventional axial helical CT resulted in a negative-predictive value for determining tumor resectability of 96% compared with 70% for conventional axial helical CT alone. Vargas et al 19 evaluated the resectability of pancreatic carcinoma using MDCT and found an overall negative-predictive value of 87%. The negative predicative value for detecting vascular invasion with the use of curved planar reformats was 100%. The lymphatic drainage of the pancreas is primarily to the pancreaticosplenic nodes that accompany the splenic artery. Some drainage also occurs to the pancreaticoduodenal nodes and the superior mesenteric preaortic nodes. 20 The detection of metastases involving these lymph node groups in patients with pancreatic cancer on CT remains challenging. 15,18 The main criterion used to assess tumor metastases to lymph nodes is nodal enlargement. However, all enlarged nodes do not necessarily contain tumor, and all normal-sized nodes may not necessarily be free of tumor. Zeman et al 21 found nodal staging accuracy to be only 58% when evaluating TNM staging of pancreatic carcinoma using helical CT. Muller et al 22 found a sensitivity and specificity of only 22% and 57%, respectively, for the detection of nodes involved by pancreatic cancer. A study by Diehl et al 15 showed that nodal involvement was detected in only 54% of cases, but the overall accuracy of CT for staging pancreatic cancer remained high at 91%. The accuracy of readers in determining resectable versus unresectable disease was much higher at 96% and 84%, respectively. 21 Regional lymph nodes are typically resected at surgery; hence, nodal enlargement is not considered a contraindication to surgery if there are no other signs of advanced disease. The liver is a common site for pancreatic metastases, and their detection is critical for accurate staging. 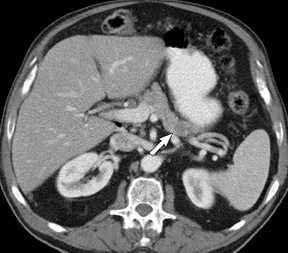 Hepatic metastases are best seen during the portal-venous phase of enhancement, and they typically appear as low-attenuation lesions compared with adjacent normally enhancing liver parenchyma. 14 Metastases from pancreatic carcinoma are also commonly seen in the lungs and peritoneum. 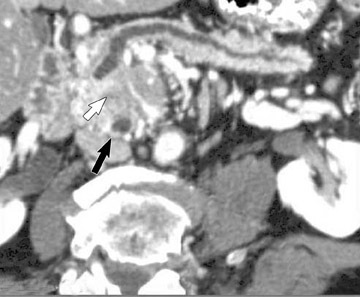 Excellent results have been found using helical CT for the identification of patients with unresectable disease due to pancreatic carcinoma. 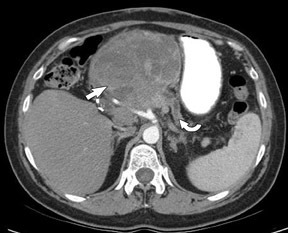 19 However, CT does not perform as well in identifying resectable pancreatic carcinoma. 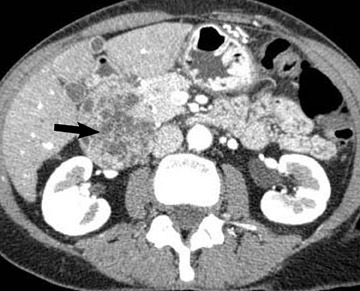 Patients may be understaged because of missed small hepatic metastases and peritoneal deposits. Bluemke et al 12 found that 42% of patients were inaccurately staged because of missed liver metastases. The routine use of thin collimation is essential and can aid in the detection of lesions <5 mm. 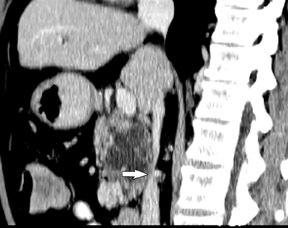 Unfortunately, liver lesions that are this small are difficult to characterize accurately, limiting the specificity of contrast-enhanced CT. These small hepatic lesions may represent cysts or hemangiomas as well as metastases. 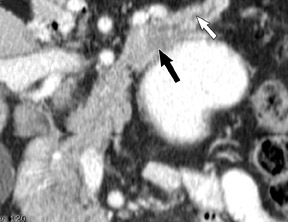 The sensitivity of dual-phase helical CT for detecting hepatic metastases is only 75%. 14 Most missed liver lesions are <1 cm in size or are surface lesions that are detected only during surgery. Islet cell tumors are highly vascular tumors with similar enhancement characteristics for both functioning and nonfunctioning ICTs. These lesions enhance more intensely than the normal pancreatic parenchyma during both the arterial and venous phases. 25 This characteristic is helpful in differentiating these lesions from other pancreatic masses, such as adenocarcinomas, which are hypovascular. Multiphasic MDCT plays an essential role in the detection of small ICTs. Their detection is dependent upon correctly timing image acquisition relative to injection of the intravenous contrast bolus. The hypervascular nature of ICTs suggests that they are best seen during the arterial or pancreatic phase (Figure 7). This has been confirmed by studies that have measured the mean attenuation difference between the lesion and the surrounding pancreatic parenchyma. 26 In a series of patients with functioning ICTs, Van Hoe et al 25 reported that most lesions were hyperenhancing but only a few were more conspicuous during the arterial phase. A study by Ichikawa et al 27 found no significant difference in the enhancement of ICTs when comparing the arterial and venous phases. Some tumors have an atypical enhancement pattern, particularly if they are larger with regions of necrosis, which will appear hypo- or isoenhancing to the normal pancreatic parenchyma during different enhancement phases 24 (Figure 8). Therefore, it is essential to analyze the venous phase as well as the arterial and pancreatic phases. In addition to local tumor extension, the liver and regional lymph nodes are common sites for metastases. Metastases to the liver are often hypervascular and are best appreciated during the arterial phase. 28 The sensitivity of helical CT in localizing functioning ICTs is relatively low, with studies reporting 71% to 82%. 25,27 This has been attributed to the fact that ICTs, particularly insulinoma tumors, are often small and difficult to visualize. Endoscopic ultrasound provides an alternative imaging tool, with Anderson et al 29 reporting a sensitivity and specificity of 93% and 95%, respectively, for ICT detection. 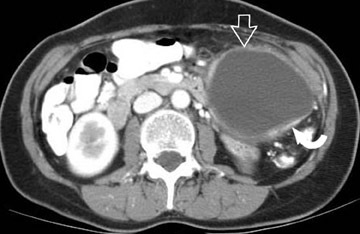 Pancreatic serous cystadenomas are rare neoplasms that occur more commonly in women (female to male ratio of 2:1) usually over the age of 60 years. 37 Symptoms are nonspecific, such as weight loss, malaise, anorexia, and fatigue. These tumors are often found in the head and neck region of the pancreas and may be large at presentation, although biliary obstruction is not typically present. Serous cystadenomas are composed of multiple small (<2 cm) cystic areas, each of which resembles a bunch of grapes. The very small cysts can have a honeycomb appearance on cross-sectional imaging. The central fibrous stroma is often hypervascular and may calcify, thus exhibiting the characteristic centrally located calcified stellate scar (Figure 10). However, this is seen in only a minority of patients (18%). 38 Although these lesions are benign, they may occasionally be mistaken for malignant mucinous cystic neoplasm. 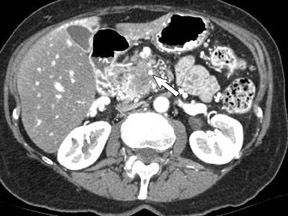 Mucinous cystic neoplasms are rare lesions that occur predominantly in women (female to male ratio of 9:1), usually at a younger age than serous cystadenomas. They usually occur in the body and tail of the pancreas and are often large at presentation (>10 cm in diameter). 38 Symptoms are nonspecific, related to local mass effect that causes adjacent organ displacement or compression. The differentiation of mucinous cystic neoplasms from other cystic lesions of the pancreas is crucial because of their malignant potential, with a reported 5-year survival rate of 17% to 63%. 39,40 Mucinous cystic neoplasms may be composed of several cystic areas with each cyst typically >2 cm in diameter or may be a solitary large cystic lesion 38 (Figure 11). The presence of septations or solid nodules within the wall of the cysts can help differentiate them from other cystic lesions. 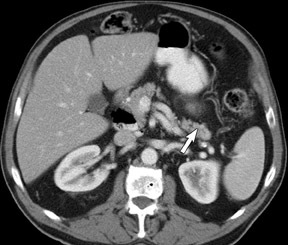 Such features are uncommon in serous cystadenomas and pancreatic pseudo-cysts. 40 Calcification, if present, is peripheral and curvilinear. In a study by Procacci et al, 40 the presence of calcification, a thick cyst wall (>2 mm), and septations correlated with a 95% risk of malignancy. Patients with questionable cystic lesions should undergo percutaneous cyst aspiration. Intraductal papillary mucinous tumor (IPMT) of the pancreas typically occurs in men who are older than 60 years. 41 Patients with IPMT often present with symptoms of recurrent abdominal pain or unexplained weight loss. The absence of predisposing etiologic factors for chronic pancreatitis (eg, alcohol abuse and hyperlipidemia) should alert the clinician to the possibility of an IPMT. There are 3 types of IPMT: A main duct form that causes diffuse or segmental dilatation of the main pancreatic duct; a branch duct form that causes cystic dilatation of the branch ducts; and a mixed form with elements of both types. 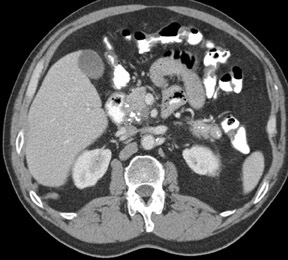 Typical features seen on CT are segmental or diffuse dilatation of the main pancreatic duct (MPD) >2 mm and/or cystic lesions corresponding to dilated branch ducts that are usually in the uncinate process. These findings may be seen together or individually 41 (Figures 12 and 13). Gland atrophy is often present, and dysmorphic calcifications may be seen in the dilated duct. 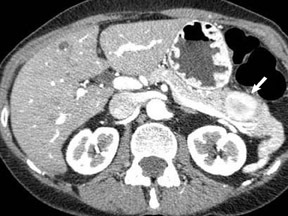 41 However, pancreatic calcifications seen with chronic pancreatitis are typically not present. Endoscopic retrograde cholangiopancreatography can help confirm the diagnosis by showing mucin emanating from a bulging papilla with a dilated MPD. 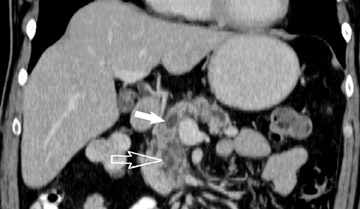 The introduction of MDCT and postprocessing techniques with 3D manipulation of the data set have greatly improved imaging of the pancreas. These advances should further facilitate early detection of small pancreatic lesions and are likely to impact the treatment of pancreatic tumors, especially pancreatic adenocarcinoma. The use of multiplanar reformatted images and 3D representation of the vascular structures helps in accurate staging of pancreatic tumors and aids in successful surgical resection. MDCT of pancreatic masses. Appl Radiol.